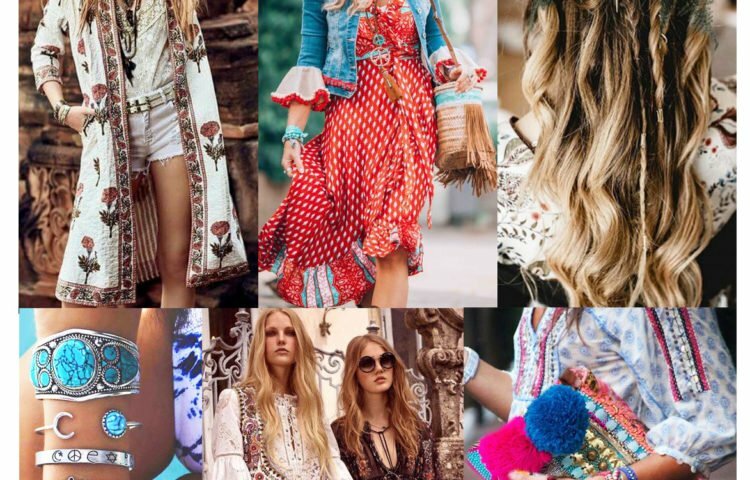 Bohemian style is more than just a fashion trend – it’s an actual culture in its own right, one that comes with a very specific ideology and complicated history. While it’s closely associated with the hippie fashions of the 60s and 70s, these days, bohemian fashion is part of the mainstream culture. But fact is, boho fashion actually started out as a counterculture back in the 19th century. 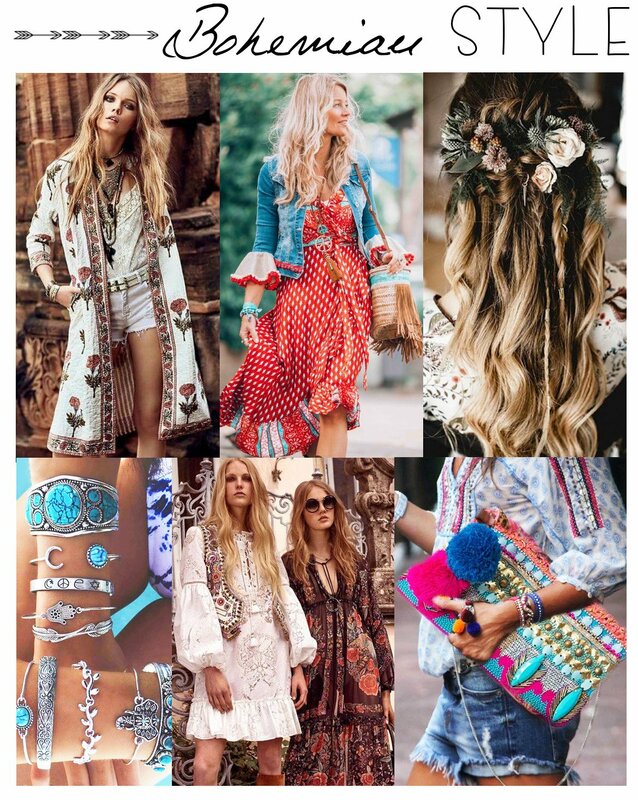 Today, the wide variety of boho clothing and accessories make the style an actual phenomenon, one that follows the lines of effortless, relaxed fashion, with its loose-fitted clothing items, casual accessories and overall artistic, creative mishmash of elements. The fashions labeled as bohemian represent the lifestyle ideology that comes with it: an alternative to the traditional way of dressing, paired up with an equally alternative, more liberated lifestyle and a social stance against everything from materialism to society’s constraints. Bohemian style is defined as an alternative type of fashion, different from the mainstream trends of any given period in time. In fact, this exact definition applies to the entire history of the trend. Over 200 years ago, bohemian was a term referred to an exotic style sense, usually associated with the artists of the time, as well as with writers and certain eccentric intellectuals. The first mention of the Bohemians dates at the end of the 18th century, during the time of the French Revolution. Back then, due to the social and economic climate, artists and creatives alike were forced to a life of poverty. As a result, the artists of the time started wearing used and old clothing. Soon after, once the economic climate stabilized, artists began expressing their creative side more through clothing – and more often than not, in eccentric and highly artistic ways. The general perception of the era was that artists dressed similarly to nomadic gypsies, who had their origins in the Balkan area of Eastern Europe, in a region called Bohemia. As a result, ‘bohemian’ became synonym with a culture, or, better said, counterculture, associated with creativity, artistic expression, as well as disregard to social constructs and mainstream aesthetics. 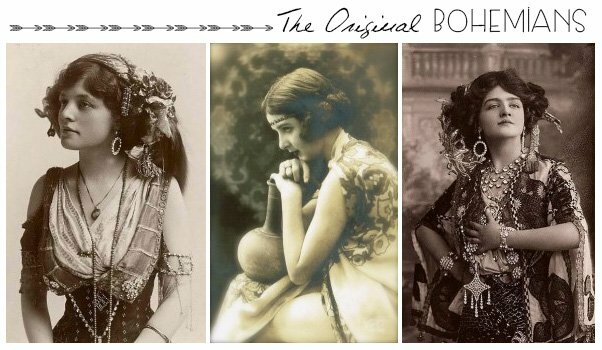 FACT: Bohémien was a common term describing (often in a pejorative way) the Romani or “Gypsy” population of France, who originated in northern India and arrived in Mid-West Asia and Europe around 1,000 years ago. Towards the middle of the 19th century, the Romantics (intellectuals who identified with the Romantic art of the era) became associated with the French Bohemians. The groups started incorporating flowy garments, oriental-inspired clothing, medieval elements and colorful materials in their looks, as well as gypsy-inspired accessories and hair, old coats and distressed fabrics. While appreciated by many at the time, these details were all very different from the mainstream fashions of the era. With time, Bohemians’ style evolved considerably. What started as a necessity (dressing poorly due to poverty) became an ideology – one against materialism, pro communal living spaces, against social conventions and often against personal hygiene. Later on, the Bohemians took part in the Aesthetic Movement, which stood against the stiff corsets and crinolines of the era. As a result, the Aesthetic Movement followers embraced a new lifestyle and new style of clothing, focused on loose fits, hand embroideries and medieval-inspired designs. The literature and music of the time began referencing the newly-developed counterculture, with artists like Henri Murger and Puccini dedicating masterpieces to the Bohemians. FACT: The first mention of the Bohemians dates at the end of the 18th century, during the time of the French Revolution, when due to the social and economic climate, artists and creatives alike were forced to a life of poverty. In the early 20th century, designers started taking the bohemian fashion to the next level. Among them was Paul Poiret, who incorporated a variety of ethnic details into his designs, including Russian and Middle Eastern elements. Likewise, textile designer William Morris created a variety of patterns for both interior design and fashion, featuring lush floral prints, paisley and swirls, all intricate and highly ornamental. The Bohemian Movement took a new meaning in the 1960s, one that was about to change the definition of fashion. Back when the Hippie Movement stood against conventional lifestyles, new clothing styles including ethnic dresses, embroideries, mixed prints, volume, fringe and flared silhouettes started getting popular. The hippies rejected everything from mainstream values to materialism, and from established institutions to social constructs, which was apparent in their fashion choices that went against the streamlined, polished and classy silhouettes of the previous decade. FACT: By 1872, a Bohemian Club in San Francisco was considered the hottest spot for the meetings of established creative elite including journalists and artists. If you are looking forward to starting a bohemian wardrobe, a capsule collection filled with boho staples is a great kick-off point. What you need is no more than 20 essential key pieces you can mix and match easily. Because, fact is, the good news about going the bohemian route is that almost everything matches everything. From tops to bottoms and from outerwear to accessories and one-pieces, here is our example capsule collection to help you get started. 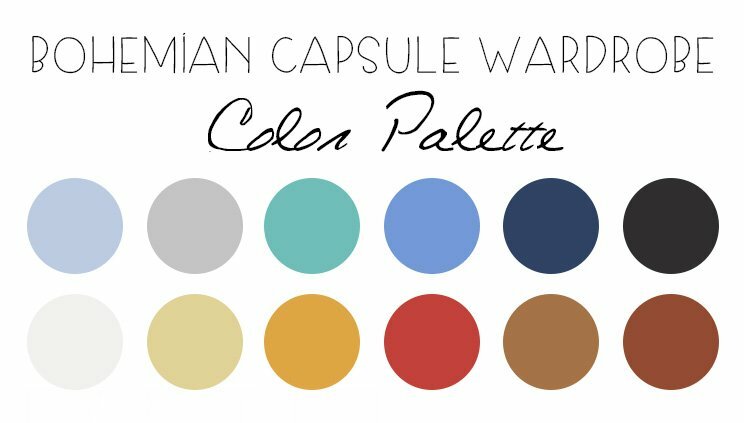 One of the easiest rules to apply when it comes to creating a bohemian capsule wardrobe is to start from a curated color palette. Tip 1: Include both warm and cold hues. A good general rule is to opt for a collection in 6 to 12 hues. Choose less if you gravitate towards a minimalistic style and more if you love prints and aim for a boho look. Gold is one color that works really well with all of the colors from the boho palette. As a result, incorporating some gold-colored accessories into your boho-inspired outfits is always a good idea. 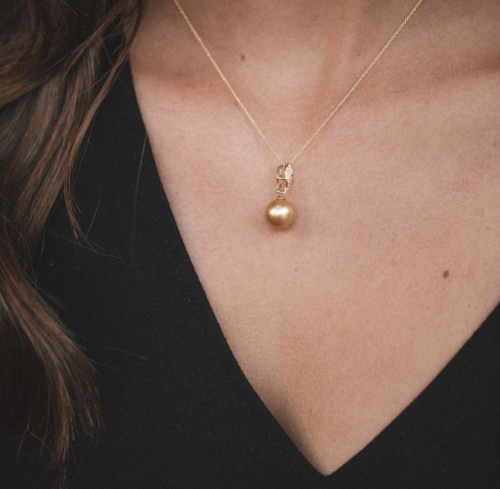 Golden South Sea pearl pendants are one of our favorite options. These pendants are extremely unique and sophisticated, two words which symbolize what Bohemian style is all about. Browse our collection of golden South Sea pendants to find the perfect design for you. Tip 2: Use sister and cousin shades. For example, incorporate three shades of brown (caramel, maroon, latte) or fours shades of blue (turquoise, steel, sky blue and navy) and avoid solitaire, isolated colors. This tip will help you curate a capsule wardrobe where everything is easily matched, which adds to the versatility of the collection. Tip 3: Include neutrals, pastels, as well as rich hues. Avoid artificial, neon colors, as well as highly saturated garments. Tip 4: Mixing prints is much easier when you start with a hue palette, which is why putting a lot of thought into your color scheme is essential. Various decorative trims: pompoms, ethnic prints, etc. Bohemian style comes with a wide range of silhouettes and cuts, and just as many, if not more characteristic materials, patterns and techniques. As a general rule, bohemian designs incorporate natural materials in nature-occurring shades and designs inspired by art and rustic elements, plus a plethora of ethnic, folk and floral patterns. 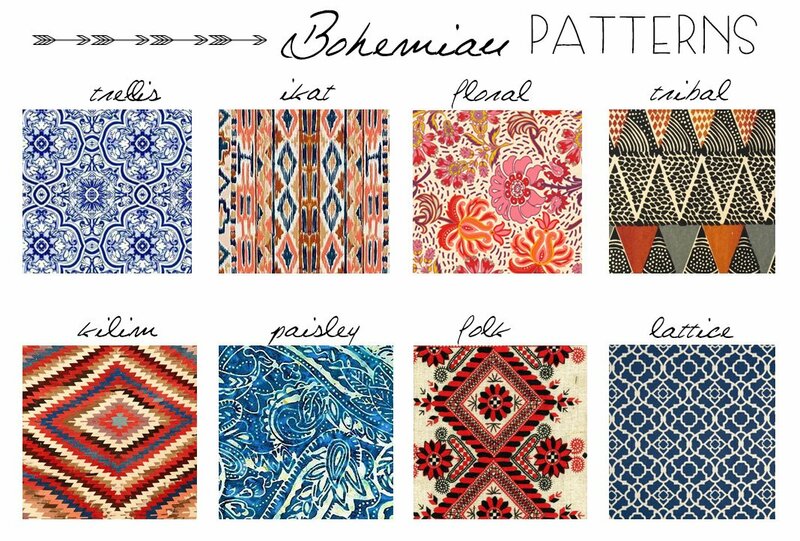 We’ve compiled a glossary of all the main bohemian elements out there, starting with the most commonly used fabrics to the most iconic prints and patterns. FACT: The word ‘crochet’ is derived from the Middle French word croc or croche, which means hook. The first published crochet patterns appeared in the Dutch magazine Pnlop in 1824. Rattan – used in the creation of bags and shoes. Lattice – a repetitive pattern that is not necessarily bohemian, but found often as part of boho clothing in its more intricate versions. FACT: The paisley pattern finds its origins in Persia back in 221AD. Its distinctive curled teardrop shape was originally called “boteh jegheh” and was created as a motif for a religious movement known as Zoroastrianists, representing the symbol of everlasting life. Patchwork – used in the creation of bags (either textiles or leather) or incorporated in clothing designs either as a main textile or as an applique. Appliques – including crystals, sequins, beads, lace and florals, used to decorate jackets, handbags, shoes and more. FACT: Macramé was most popular in the Victorian era, when ‘Sylvia’s Book of Macramé Lace’ (1882), instructed readers how to create household items such as tablecloths, bedspreads and curtains using the macramé technique. Bohemian style was always seen as a counterculture – until the early 2000s, that is. As a result of celebrity culture, boho style, as well as boho chic, finally achieved mainstream status in the first decade of the 21st century. With movie stars, singers, models, as well as famous celebrity designers sporting distressed denim paired with suede, maxis or flouncy floral dresses and tunics, boho style became an iconic trend in its own right. Prior to the 2000s, stars like Janis Joplin, Stevie Nicks and Donna Summer fully adhered to the boho trend during the disco and hippie-infused 60s and 70s. While the bohemian trend was embraced by many subcultures, these particular decades did not fully adopt the artsy trend to the fullest. What did these divas have in common? A plethora of cape-like shawls, top hats, circle sunglasses, winged out sleeves and flared pants, plus flower power patterns galore. She is a key figure of the boho trend – and it’s not because she has a very high profile, but because she acted as the mastermind behind the scenes. We’re talking about celebrity stylist Rachel Zoe, who reached fame in the early 2000s, when she started styling celebs that were soon to become some of the most popular bohemian style icons. Case in point: Nicole Ritchie. Nicole Ritchie is, without a doubt, one of the main characters responsible for the bohemian revival of the 2000s. Not only is the socialite / reality star / fashion designer one of the most influential boho-cool and boho-chic trendsetters, but she also has her very own lines inspired by bohemian aesthetics. Moreover, Nicole is a pro at making mega-loose fits work perfectly, as well as a master of mix and matching prints and accessorizing maxi dresses. Another pivotal celeb who revived the bohemian trend: Sienna Miller, who has been rocking the boho chic look since the early 2000s. Sienna takes an eclectic approach to bohemian style, combining elements that are not supposed to go together, yet somehow magically do. As one of the original batch of modern celebs that rocked boho fashion, Sienna let her style evolve during the years. More recently, the actress transitioned towards a more sophisticated look for the red carpet, but kept her notoriously disheveled boho look for casual weekends. While she currently describes her style as simply ‘chic’, Vanessa Hudgens was once the queen of boho-chic. While she keeps it glam on the red carpet, Vanessa does the paparazzi stroll in summer music festival-ready ensembles. Similarly to Nicole Ritchie, Vanessa’s absolute favorites include: maxi dresses, suede boots and gladiators, denims, loose tees and flowing skirts. Zoe Kravitz – With parents like Lisa Bonet and Lenny Kravitz and a stepdad like Jason Momoa, it’s no wondering that actress Zoe Kravitz is a veritable bohemian style trendsetter. As a result, Zoe is a master at looking perfectly effortless at all times, whether she is rocking the red carpet or doing the pap walk. Mary-Kate and Ashley Olsen – Although these days they’re icons of the modest clothing style, the Olsen twins were part of the original crew who made bohemian style the mega trend that it is today. As masters of the ‘everything goes with everything’ look, Mary-Kate and Ashley always incorporated an element of whimsy or mystery in their ensembles. Anyone who’s ever attended Coachella – Coachella has become a culture and a lifestyle in its own right and a true representation of today’s more grungy-infused bohemian style. From the Victoria’s Secret models to the social media influencers and from the A-listers to the regular folk, Coachella is all about that SoCal, effortless look. The must-have elements for mastering the SoCal look: distressed denim, lace cover-ups and crochet crops, bandanas and headbands, boots of all kids, sunnies, temporary tattoos, flouncy maxis and an overload of accessories. What is one jewelry piece that many of the bohemian style influencers we covered above wear regularly? Pearl studs. These influencers, including Zoe Kravitz (pictured on the left), use pearl studs to accent various outfits in creative ways. The earrings work well with a variety of different colors and add the perfect touch of refinement. 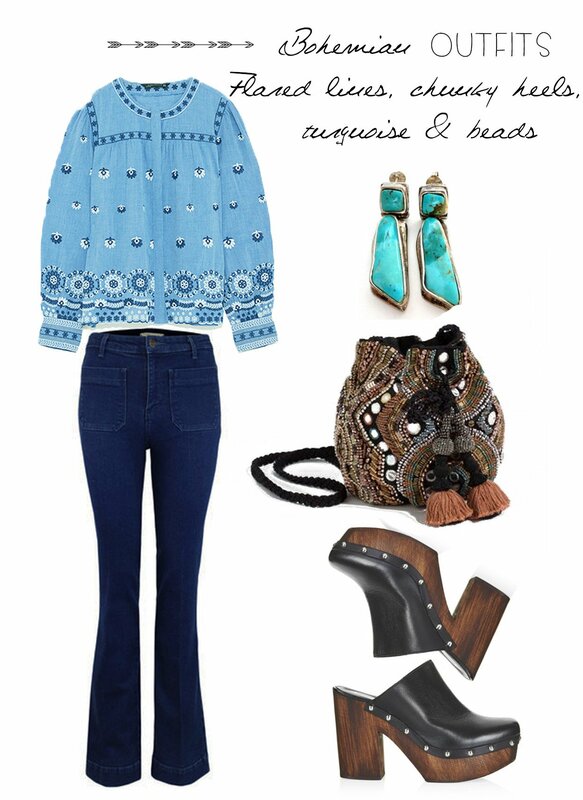 When aiming for the bohemian look, the jewelry and accessories you sport are just important as your clothing. 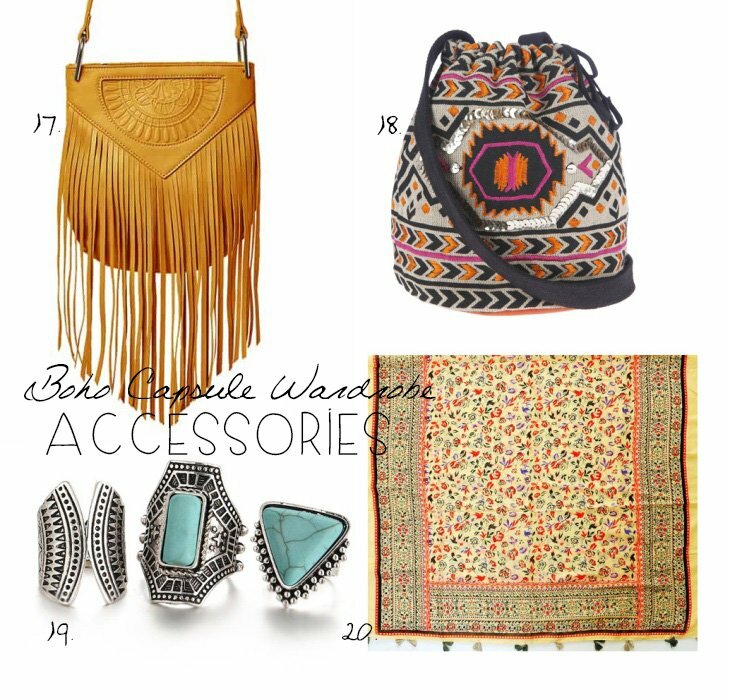 From turquoise bling to headbands and from perforated bags to fringe and tassels, here are the main types of accessories and jewelry you need in order to curate an all-boho wardrobe. Bohemian accessories are pretty easy to identify. As a simple rule, anything that’s plain, basic and simple is probably not bohemian. 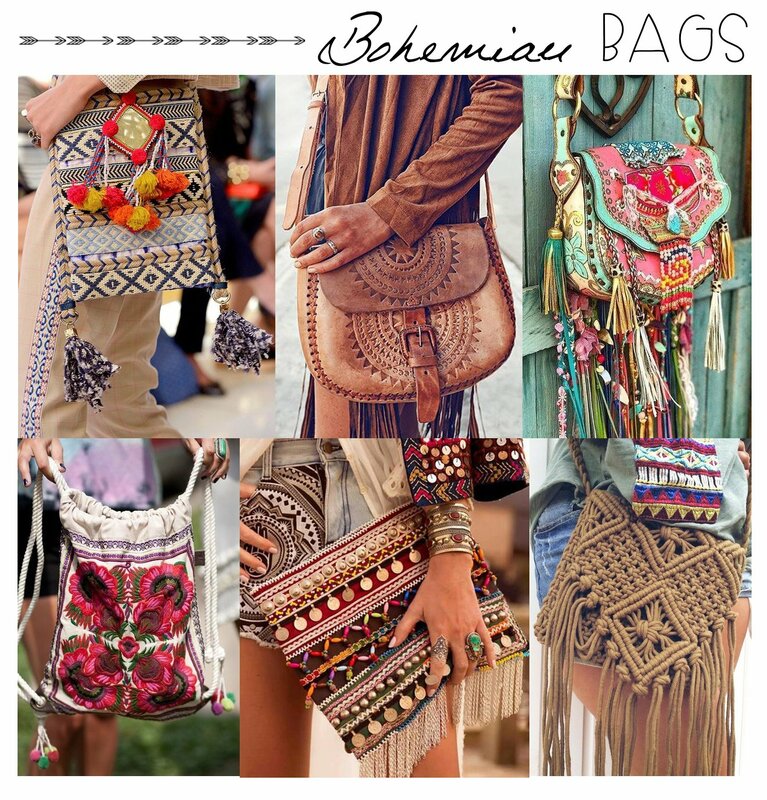 Firstly, if you are looking at a handbag or a pair of shoes that feature trims, pompoms, tassels and fringe, perforated elements, appliques and embroideries, ethnic prints and patterns, then chances are you have discovered a boho treasure. Moreover, anything that comes in streamlined silhouettes, structured cuts, classic designs or elegant lines is a big departure from bohemian style. As for the fabrics, natural is best when it comes to picking out bohemian accessories, and that includes canvas, leather (including good faux alternatives), linen, rattan, wood, rope and so on. Moreover, prints and patterns are one of the most typical bohemian elements when it comes to accessories like handbags, shoes or headwear. From Mexican prints to tribal African patterns and from ikat to Turkish, Persian or Moroccan details, the range of boho-infused accessories is gorgeously inspiring. Bohemian jewelry is the very opposite of minimalistic. In fact, one can easily identify boho bracelets, necklaces, rings and earrings based on their maximalist look. Intricate or large in size, statement or beaded, with or without gems and in a plethora of antiqued finishes, bohemian jewelry comes in many shapes and forms. FACT: Pearls have been used in jewelry since ancient Greece and to this day, they are one of the most, if not the most valuable gem in many cultures. One of the easiest ways to identify bohemian jewelry is to ignore all the ultra-glossy and perfectly polished metallic pieces and go for more muted, matte metals instead. Similarly, if they come with turquoise gems, tribal engravings, natural gemstones or Moroccan-inspired designs, even better. Just like clothing and accessories, bohemian jewelry is focused mostly on natural materials, often incorporating genuine gemstones, white and colored pearls, leather, opal, wood (bangles, beads) and bone in the designs. FACT: The word “Turquoise” originates in the 17th century, when trading brought the stone from Persia through Turkey towards Europe. Turkey was known as ‘Turquie’ in French, fact which led the locals name the material ‘Turquies’ (‘Turkish’) in reference to its coming from Turkey. If you want to incorporate pearls as part of you bohemian outfits, look for jewelry pieces that combine the gems of the sea with fringe, tassel and other such traditional boho elements. Alternatively, mother of pearl jewelry pieces in fantasy designs and combined with other semi-precious gems or antiqued finish metals are very boho-chic, perfect for complimenting weekend and vacation-ready outfits. For dressier occasions, use pearls in order to elevate the look of your outfit by bringing it out of the hippie sphere and more into the boho-chic territory. If you choose precious metals, opt for ones that are not high-gloss, but rather have a matter, more subtle shine. Moreover, choose natural gems and stones whenever in need of dressing up, as thoughtfully selected jewelry pieces have the power to give any outfit a more polished vibe. While boho in itself is a departure from polished styles, if you want to still rock a bohemian dress at a fancy event (wedding, anniversary, festive occasion), a baroque pearl ring or pearl, amethyst (or your precious stone of choice) earrings are a great way to have the best of two worlds. Pearl jewelry is one of the most popular choices of brides that opt for bohemian wedding themes, as well as beach weddings and ocean-inspired themes. Among the most popular choices: pearl hairpins, where the gems of the sea are combined with leaf motifs, textile or real flowers and other gems, headpieces, as well as intricate statement bracelets and anklets. 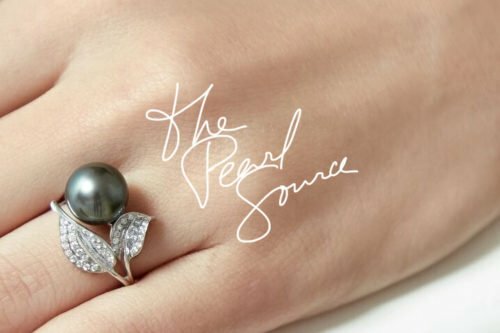 One really great Bohemian-inspired jewelry option is a large white pearl ring. 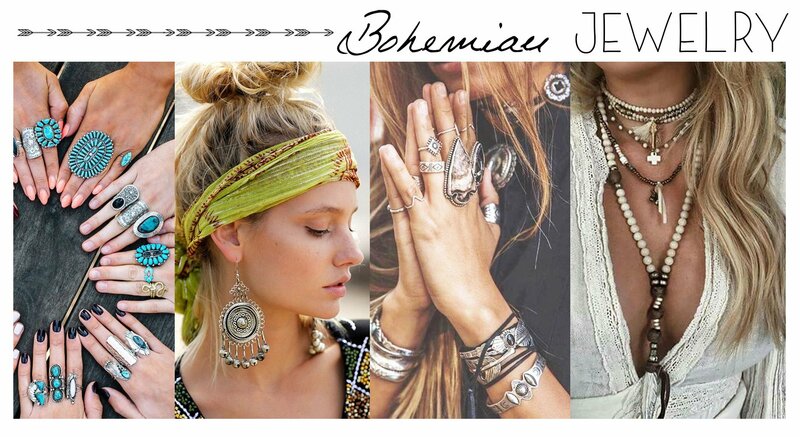 Combine it with other rings on the same hand to create a jewelry look that pays homage to Bohemian fashion. South Sea pearls are some of the largest types of pearls, making them an especially fantastic choice. 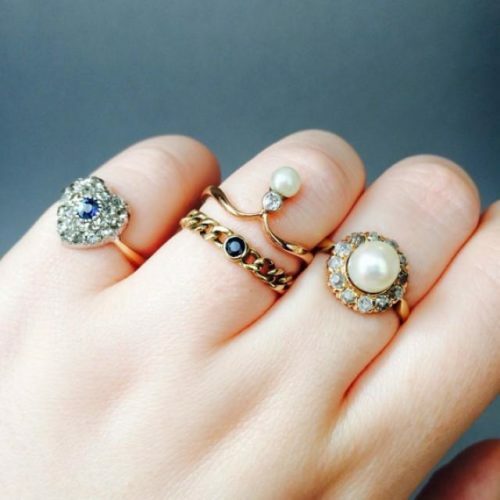 Contrast the large pearl ring with other rings that feature smaller gems for a captivating look. 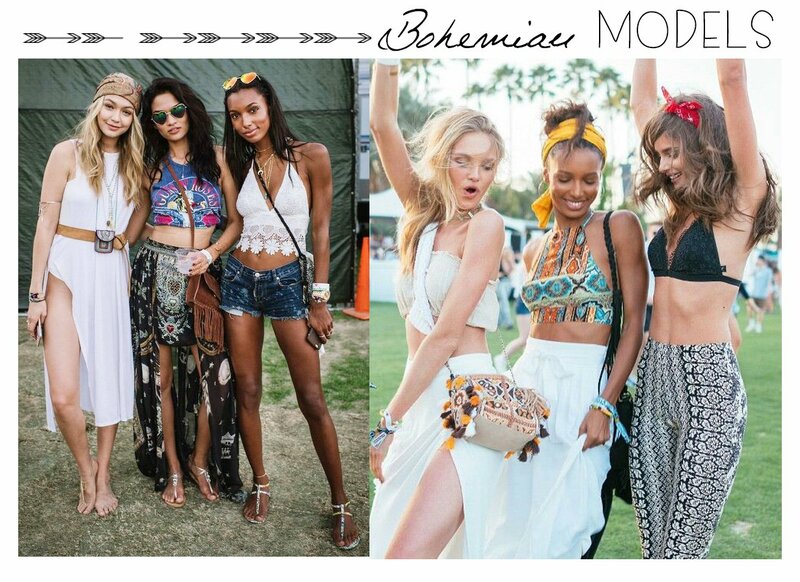 Boho-chic style is defined as the upgraded, elevated bohemian aesthetic. As its name suggests, boho-chic is a merger of styles: bohemian and chic – and, as a result, it’s a fashion fusion that takes the classic bohemian look to a more sophisticated level. Not only that, but boho-chic is more urban-focused than bohemian style, which finds its roots in nature, rustic settings, old eras and not as much in a contemporary city environment. 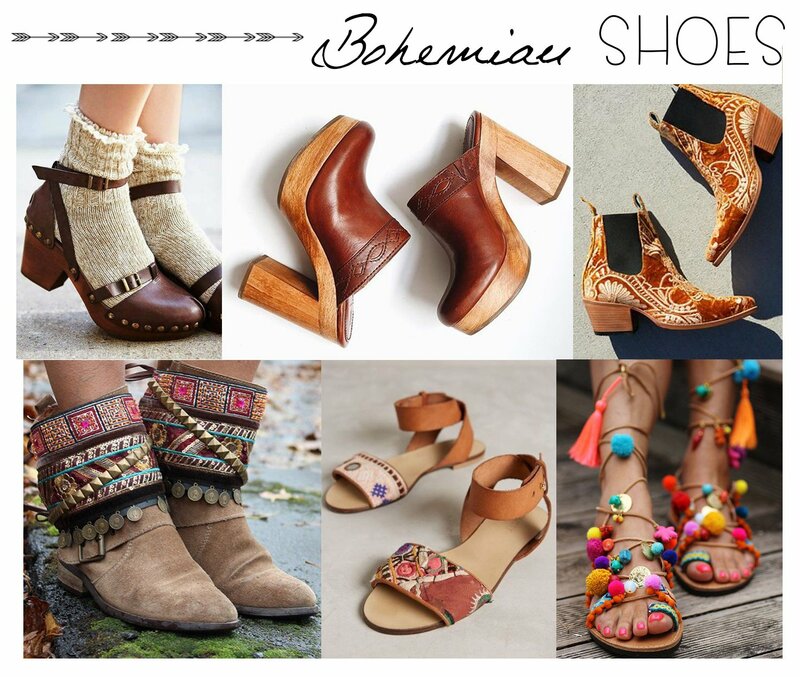 Compared to the classic bohemian style, boho-chic fashion comes with a few characteristics. It features embroideries and appliques. It combines basics with hippie garments. Mix hard and soft elements to achieve an eclectic chic look. Switch the bohemian headbands, turbans and bandanas with retro sunglasses and fedora hats. FACT: Pearls are the only jewels created by a living animal. A natural pearl of value is found in less than 1 in every 10,000 wild oysters. These days, bohemian style falls on a large and varied spectrum. From fashions reminiscent of the funky 1970s, loaded with flared sleeves and pants to romantic bohemians, where lace, braids and prairie silhouettes dominate to the urban-edgy bohemian who sports a city version of the artsy aesthetic, the range is very diverse. 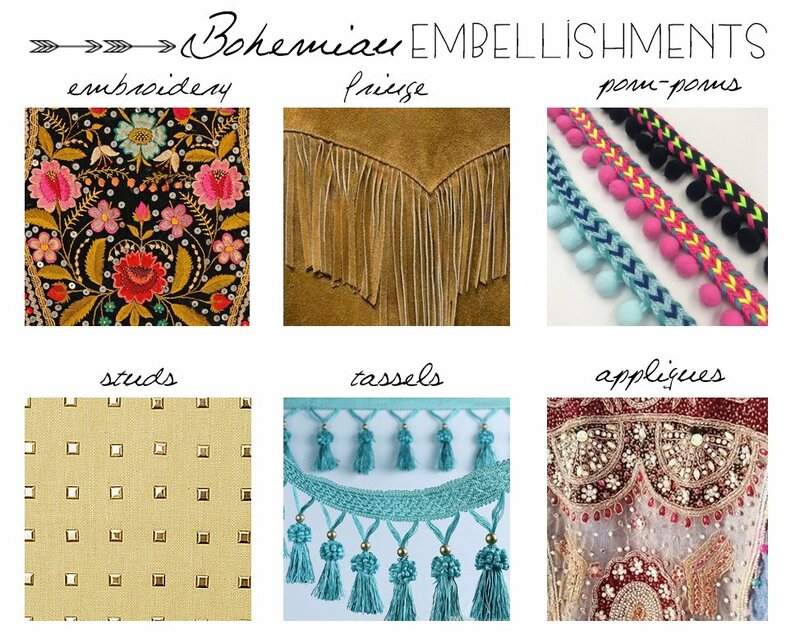 Which type of bohemian are you? 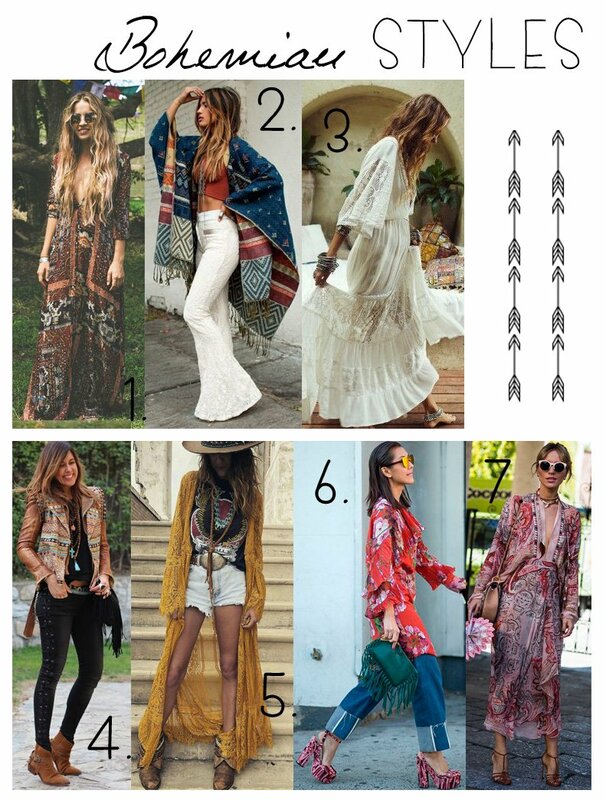 Here are a few characteristics defining each and every type of boho lover out there. Inspired by the original bohemians of the 60s, the hippie bohemian wears groovy tie-dye prints, maxi dresses with ultra-long locks, headbands and flat sandals. Vintage rock t-shirts paired up with maxi skirts are another option, combined with worn-out suede leather jackets. 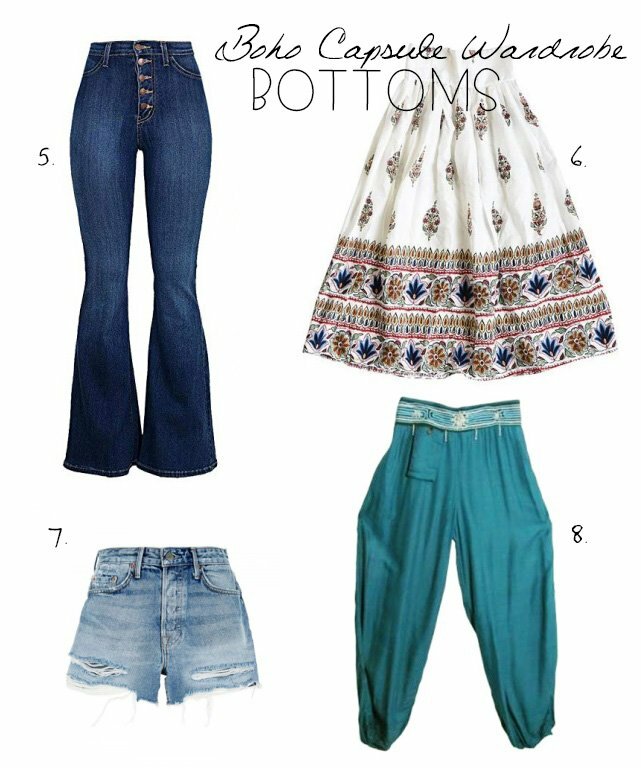 Wooden clunky heels, Swedish hasbeens, high platforms, ultra-flared denims, bishop and trumpet sleeves in dramatic volumes are the main items in the wardrobe of a 70s bohemian lover. Groovy prints in large scale designs are other 70s staples, especially when paired with chunky heels or platforms and wooden accents. Vintage overload, delicate crochet, mesmerizing appliques and flouncy maxis are on the checklist of a romantic bohemian. Gravitating towards softer hues, ivories and blush tones, the romantic bohemian style is infused with a sense of whimsy and fairytale vibes. Florals, sheer fabrics, romantic loose curls and bedazzled accessories are all part of the romantic boho look, ideal for brides in love with the bohemian style. Darker hues, black, leather, studs and more form-fitted silhouettes are part of the edgy bohemian’s arsenal. Vintage t-shirts, grunge details, leather bracelets and metallic elements are also staples of the edgy boho look, which merges two styles without looking disjointed. Cowboy boots, daisy dukes and denim shorts, lots of denim in everything from jackets to vests and jeans, leather belts, perforated accessories, fringe galore, cowboy hats and fedora hats, warm hues like caramel, mustard and rich browns – all part of that country-infused boho style. 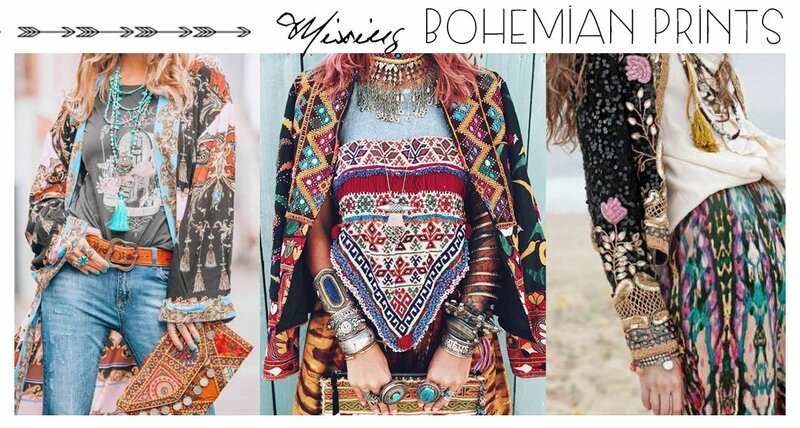 Eclectic bohemians wear a mishmash of pieces, each inspired by different cultures, eras or styles, masterfully blended together in one imperfectly cohesive outfit. 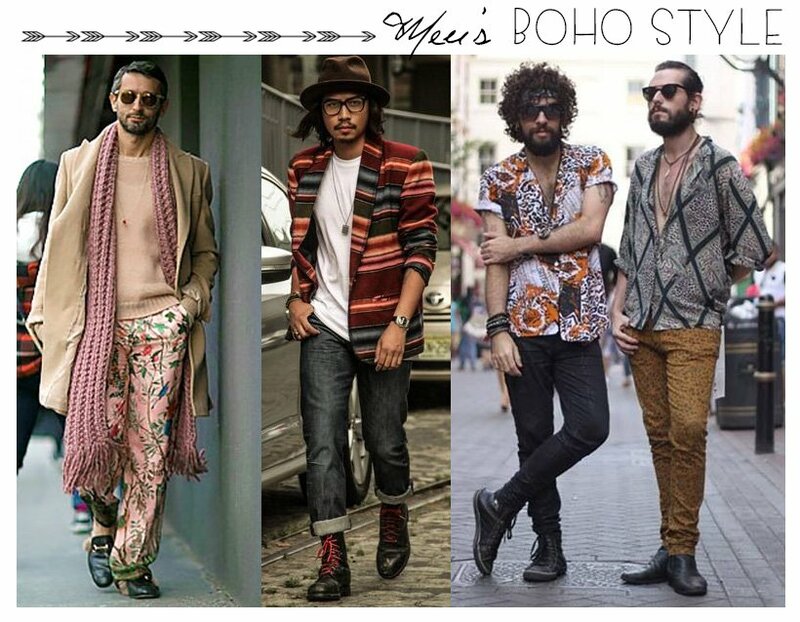 While following zero fashion rules, the eclectic bohemian creates a very unique sense of style, where creativity is the main factor. Also called boho-chic, this type of bohemian aesthetic is a slightly more polished version of the often disheveled boho style. Ditching worn-out clothes for crisper versions and often switching the gladiators and the clunky heels for sleeker alternatives, boho chic lovers choose to upgrade the bohemian style by including more polished clothing items and accessories in their outfits. The boho-chic style appeals to many women because it creates a look that’s unique and eclectic, but at the same time refined. Tin cup pearl jewelry is the perfect accessory for a boho-chic aesthetic. The tin cup designs integrate a classic gemstone, but do so in a way that’s fun and creative. Use tin cup pearl jewelry to add the perfect finishing touch to any boho-chic outfit. While bohemian fashion certainly doesn’t come with a strict set of styling rules, there are quite a few formulas that simply can’t go wrong. If you’re on a mission to become a veritable bohemian trendsetter, but not quite sure yet on how to start combining your clothing pieces and accessories in order to master the boho look without room for a fashion faux pas, these next outfit recipes are here to help. 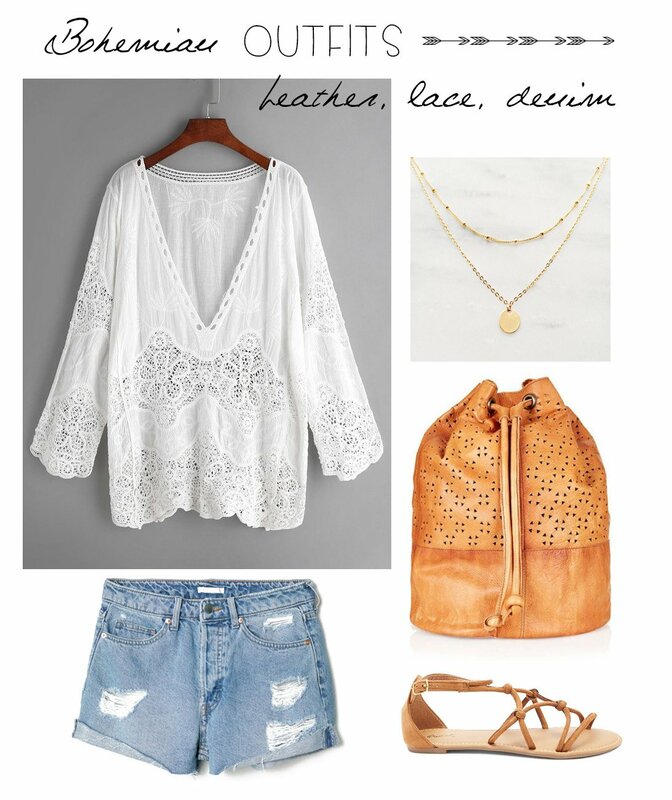 A casual summer look that is as boho as they come, without a specific hippie influence. Relaxed, effortless and carefree, this look is the perfect depiction of SoCal style. It doesn’t get more boho than this. 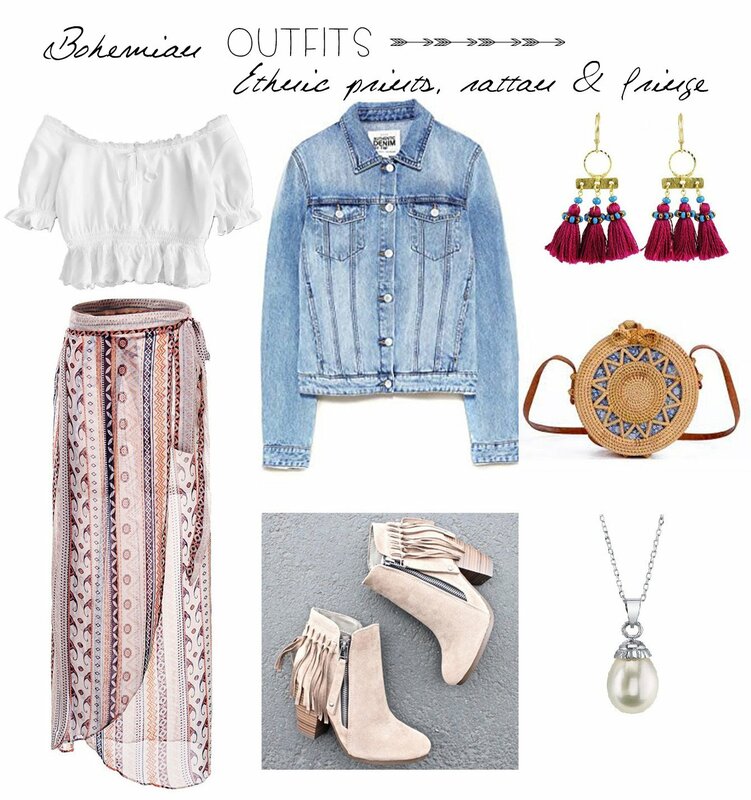 A more feminine approach to bohemian style, with the mandatory ethnic prints in the mix, acid wash denim, peasant details, pearl accents, rustic rattan, fringe… and some more fringe. A posher version of bohemian style – or boho chic – now with an elevated, city vibe, perfect for nights out on the town. Featuring the classic disco era flared pants silhouette and an embroidered peasant top, this outfit brings chic elements into the mix, like a swanky beaded bag and chunky heels. FACT: Flared pants or bell-bottoms were at their peak in fashion during the 1970s. The belled or flared legs on bell-bottom pants were initially created as a functional design, worn by those who worked on boats, as the large legs allowed to be easily rolled up out of the way. An outfit that mixes bohemian silhouettes and patterns with a subtle grungy vibe. 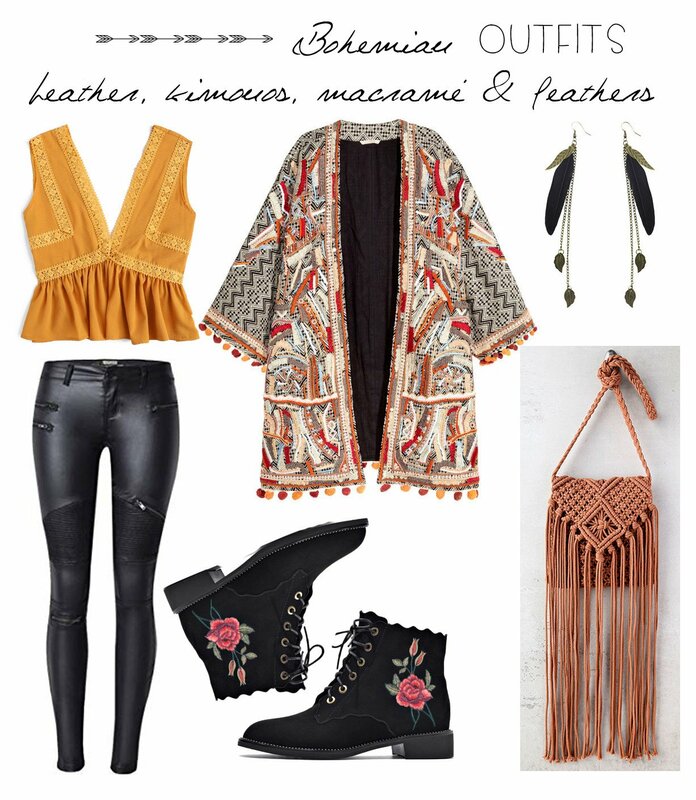 Pair up leather with lace, rich prints and embroideries and add some feathers and macramé into the mix for a look that’s decidedly boho with major eclectic elements. For a more colorful alternative to bohemian style, here is a hot pink & azure look that comes with extra movement. A flouncy maxi is paired with dangly earrings and a relaxed ethnic print bag for a feminine, whimsical take on boho style. Mixing prints is one of the easiest ways to take a bohemian outfit to the next level. Double up on that bohemian vibe by pairing up paisley prints with tribal patterns, Moroccan print bags with embroidered jackets and ikat maxis with floral crop jackets. The results: eclectically artsy, creative bohemian looks that are as effortless as they come. 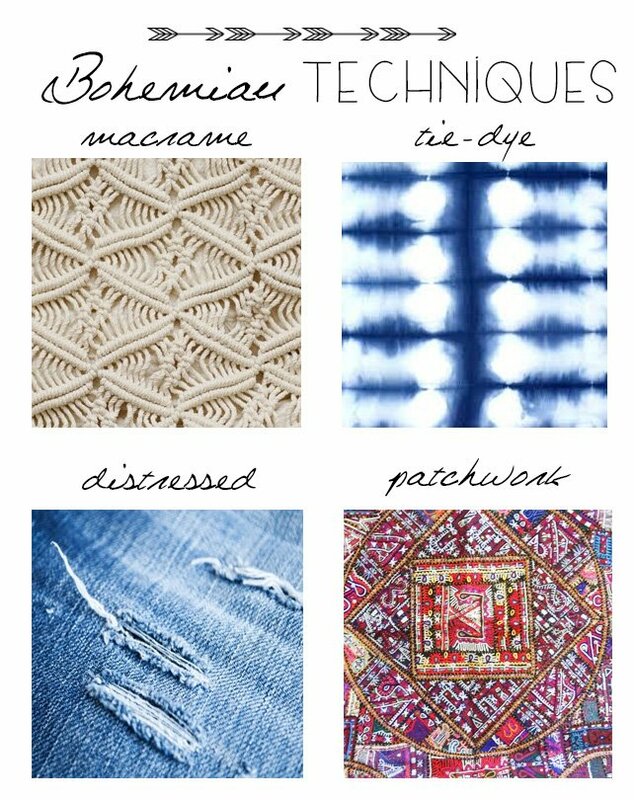 Here some of the best tips out there on how to successfully mix prints when rocking the bohemian style. The best news when attempting to mix prints: the job is half done if you are mixing clothing items that are already very boho on their own. The reason behind it: chances are, boho clothing pieces will go together without following further rules. So even if you were thinking that those retro polka dots would totally go with that tribal maxi (and chances are that they do), the result of pairing a non-bohemian pattern with a bohemian one won’t turn out bohemian, but rather eclectic. And the second good news when trying to achieve a mixed print boho look: pretty much everything goes with everything. Fact is, the fundamentals of the bohemian aesthetic focus on the unconventional aspect of clothing. And as an aspiring free-spirit boho trendsetter, caring what the others think of your mishmash look should never be a priority. Personal style comes with no set of rules and that’s particularly true when deciding to go all in on boho. If you are just starting out and consider yourself a novice when it comes to mixing prints, here’s a quick tip: simply opt for one garment of clothing that does the job for you. A wide range of bohemian garments, from tunics to maxi dresses and from long skirts to blouses already feature more than just one print. Train your eye on how to combine bohemian prints by simply wearing garments that adhere to the mixed print aesthetic. Yes, thinking and looking like a free spirit is a great way to go, but what if you want a more curated look, one that’s less unconventional? Insert solution: curate a color scheme before you mix your prints. Basically, the top rule for a successful boho look is to stick to a palette of related colors. For example, opt for a navy and white print top and pair it with a steel blue and ivory print bag. Another option is to mix prints in the same tonal range in order to achieve a cohesive, boho-chic look. Alternatively, you can choose one monochrome print top and one multicolor pattern that picks up the first color of the top. While sticking to the color scheme rules mentioned above, you can make sure that your bohemian mixed print look is even more successful by simply opting for a delicate pattern and a bolder pattern in the same look. Fact is, patterns that are in different scales are less likely to clash. As a general rule, start with the bolder of the prints you wish to mix and choose one color from its pattern. Next, opt for a more delicate design that utilizes just that one shade for your second print. Another solution if you are not yet convinced that you can pull off the mixed boho print look: no need to combine two garments that are fully covered in prints. 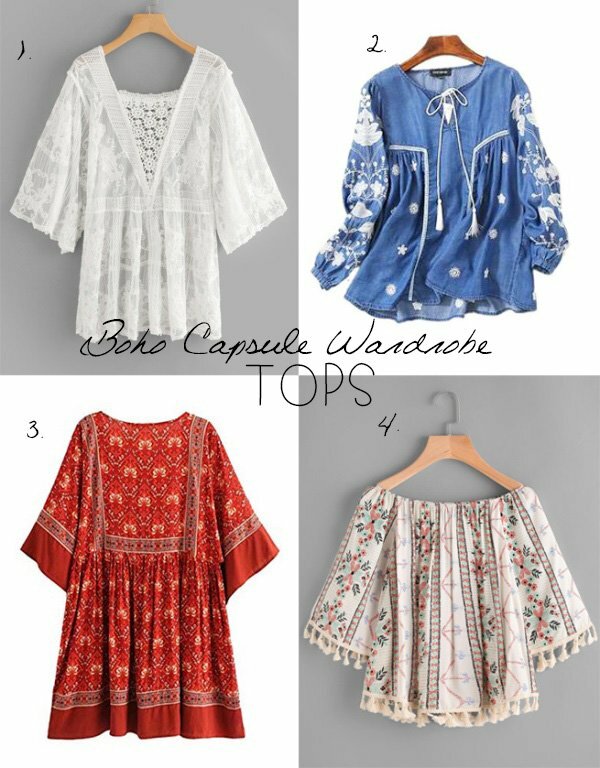 In fact, you can opt for one patterned blouse and pair it up with a jacket that comes in a solid but features a printed trim or bohemian embroidery. Simply mix one fully patterned clothing item with a printed trim if you are not yet ready to go eclectic. One of the easiest ways to pair up prints it to stick to florals. Florals are some of the most represented patterns in boho clothing, which is why pairing up two floral-adorned garments makes perfect sense. If you choose to do so, just make sure that you stick to ornamental floral designs, while leaving the abstract, stylized floral patterns out of the equation. Basic silhouettes and clean-cut lines don’t typically fit the bohemian aesthetic. However, a few plain, frill-free loose tops and classic pants are definitely welcomed, especially when the mixed print look is getting too overwhelming. 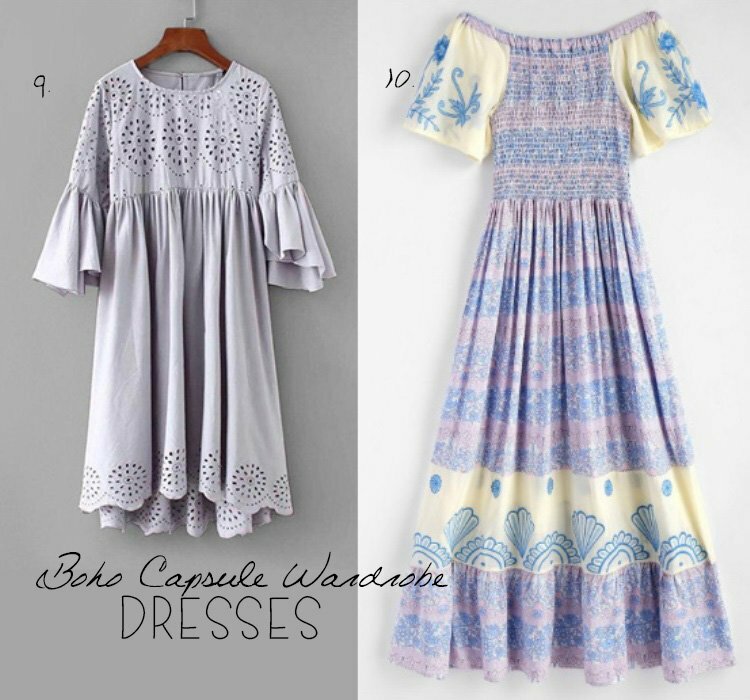 When shopping for your bohemian wardrobe, make sure to say YES to rustic, shabby and prairie trims, be it the case of crochet, lace, tassels, pompoms, patterned ribbon trims, fringe and more. Make shopping at thrift and vintage stores a monthly occurrence in order to update your boho look. On the shopping list: vintage tees, distressed denim, worn-out leather and suede jackets. Neutral-hued footwear all the way! Exception: colorful pompom sandals in rainbow hues, perfect for that beach-ready look. While those shiny green heels might look tempting, if you are committed to the boho look, suede ankle boots in caramel tones, soft greys and the entire range of browns, from amber to wheat and coffee it is! Embrace wood by incorporating wood bangles, earrings and the must-have wood platforms, chunky heels 70s style or Swedish hasbeens for a look that’s quintessentially boho. When in doubt, go for maxis. Maxi dresses, maxi skirts, maxi knits – maxi everything! The longer, the more boho it probably is. Choose comfort over structure. The key words when going boho: soft, cozy, loose and flowy! For a more urban version of boho, appropriate for various work environments, simply pair a loose clothing item with a more fitted one to achieve a perfect smart-casual balance. Choose natural over artificial. That goes without saying, but boho style finds its inspiration in nature – so anything that screams synthetic or man-made (think latex or acrylic) is probably not the best option for a boho look. Don’t pass on the headwear. Make sure to incorporate at least a floppy hat and a headband into your bohemian trendsetter wardrobe. Opt for loose, soft and ultra-cozy knits when rocking the boho looks during the chilly months. Alternatively, master the art of layering, aka the easiest way to achieve the boho look and to stay warm at the same time. When upgrading your look with heels, always choose chunky over sleek stilettos. 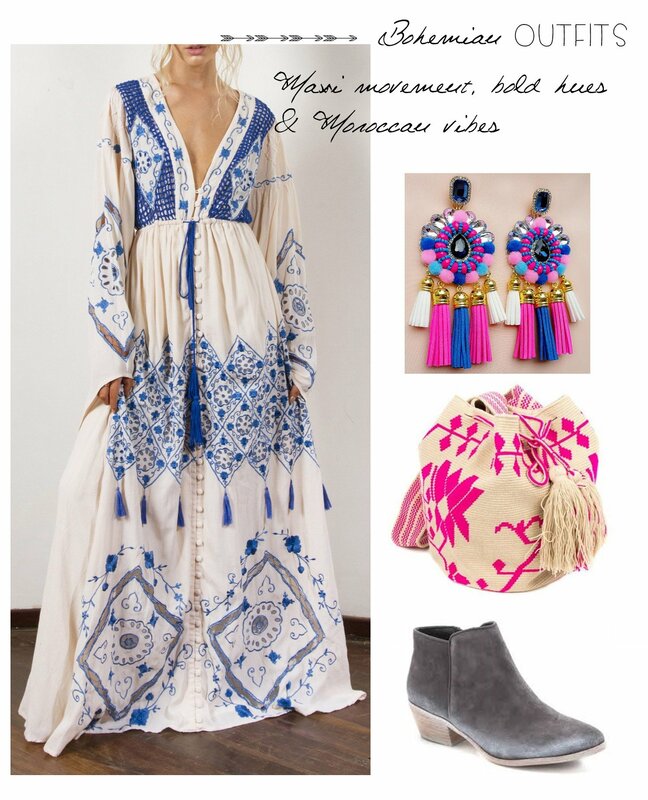 Fora boho-chic look that’s appropriate for nighttime, feel free to incorporate slimmer heel options, eclectically paired up with bohemian maxis, kimonos and other typical boho elements. Aim for a look that’s highly artisanal,whether you do that through the overall styling, the clothing pieces or the accessories. Bedazzled – everything! And we don’t actually mean rhinestones, glam and sparkle. Boho style is definitely ornate in its own right, so make sure to incorporate everything from embroideries, gem appliques, beaded accents and studs in your outfits, in addition to the previously-mentioned ornate trims. Avoid looking too neat – if there’s one rule to boho style, it’s that crisp clean looks are not it. 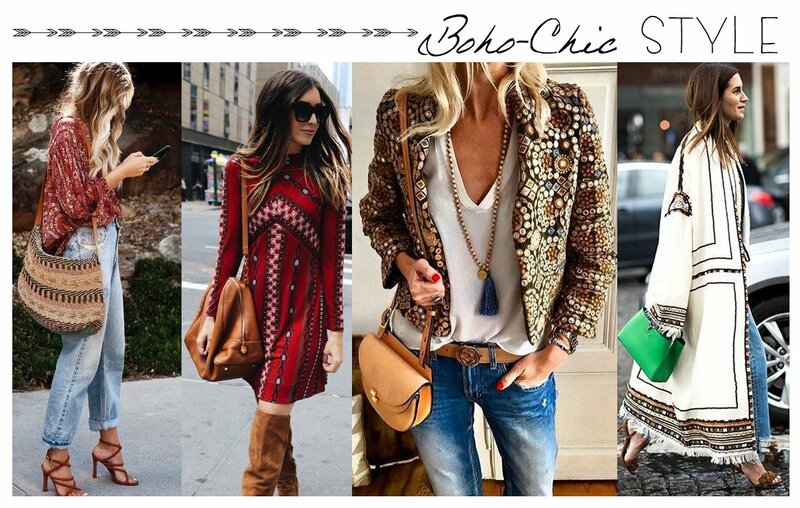 No need to iron your shirt to perfection or to shop exclusively for new clothing items when rocking the boho look. Always, always accessorize. There’s no limit to how many accessories and jewelry pieces you can wear when you’re going for the effortless-cool boho look. Make denim, suede and lace staples of your wardrobe. Ditch artificial colors, neons and too-saturated tones in favor of muted hues, neutrals or rich hues that carry a retro vibe. Go ‘shopping’ for jewelry in grandma’s old jewelry box. And while you’re at it, raid her closet as well, on the hunt for some authentic and totally priceless vintage pieces. When shopping for boho items, here’s one simple rule that applies in 99% of the cases: the more structured an item is, the less likely it is to be bohemian – and that relates both to clothing items and to handbags. When in doubt, add more layers. There’s nothing that screams boho more than a few effortlessly put-together layers, whether that’s stackable rings on your fingers, multiple turquoise bracelets, an oversize scarf over your maxi dress, a kimono over your tee or layered necklaces. When it comes to achieving that perfectly effortless bohemian look, on-theme flowy hair and natural, glowing makeup are a definite must. From braids to relaxed beach waves and from dewy skin to natural lips and soft brown eyeshadows, here are the top tips on how to perfect your boho-inspired hair and makeup. Whether we’re talking about casual or formal occasions, relaxed and effortless are the keywords when on a mission to pmaster that laid-back boho hair look. Beach Waves – The ultimate bohemian hair style that’s not only easy to achieve and considerably lower maintenance than its glossier counterparts (glam or retro waves and curls) is all about that easy, effortless, nature(beach)-inspired vibe. Braids – Both hippie and prairie-like braids are iconic when it comes to boho styles and whether you opt for a classic French, a simple Three-Way, a Dutch do, a Feather or a Fishtail braid, the results are sure to bring that sought-after quaint charm to your look. Messy Updos – Hassle-free, comfortable and chic buns are a bohemian staple and a sure way to achieve that desirable laissez-faire, effortless, non-artificial effect, typical to boho aesthetics. Tight, Structured Hairdos – If you are aiming for the ultimate boho look, rigid and structured hairstyles should not be on your radar. And the reason couldn’t be any simpler: bohemian style welcomes and is inspired by movement and flow – and rigid, conservative or polished hairstyles are anything but. Whether you’re all for trying out the latest unicorn craze and dying your hair in soft pastel shades or rocking an enviable ombre job, there are various ways to make your hair look utterly boho. Add layered highlights and lowlights in your hair. Go for ombre and balayage to add a natural multi-dimensional effect to your locks. Don’t paint hair in artificial colors like matte cherry reds, strong purples, too-blonde-blondes, blue-black and other manufactured hues. 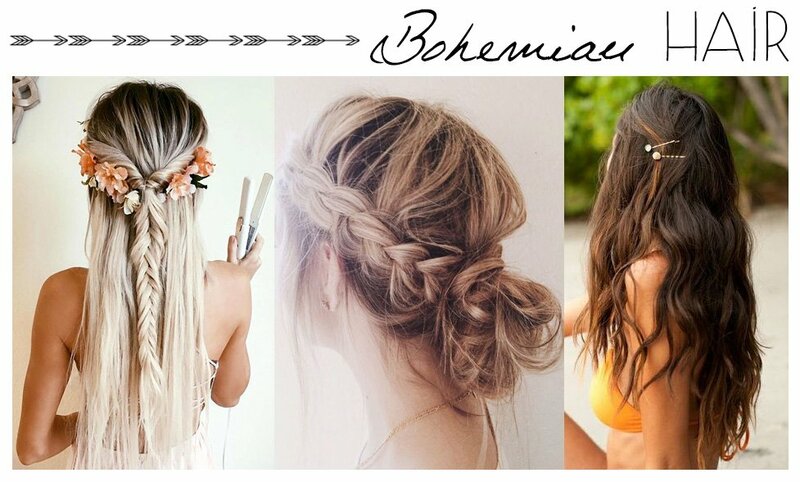 From floral headbands and pins to bandanas that add a note of edginess to any boho look, bohemian style welcomes the widest range of hair accessories, able to achieve that desirable layered, ornate yet natural style. FACT: Floral crowns are called vinok in Ukraine and part of the traditional folk dress. During the Ukrainian wedding ceremony, brides wear wreaths made out of flowers like periwinkle and myrtle. Bohemian style gives a lot of importance to natural looking skin and every boho makeup look must start with a great canvas. Hydrated, fresh looking skin that’s not necessarily flawless, but natural and naturally-glowing are the main ingredients of a successful makeup look, which is why full coverage foundations are rarely used. Instead, a gorgeous makeup look that accompanies a boho-inspired outfit accentuates freckles (if any), natural coloring or a gorgeous tan by applying a soft blush. Grab a foundation that is light and that lets your skin breathe. Opt for a sun-kissed look with the help of bronzer. Use highlighter in order to achieve a gorgeous dewy skin finish. Let your freckles shine through. Complete the look with a soft rosy or beach hued blush. For a festival boho look, opt for gemstones, glitter freckles or temporary foil tattoos to add intricate detailing to your makeup look. Don’t choose full coverage foundations. Avoid ultra-matte finishes and embrace natural glow instead. 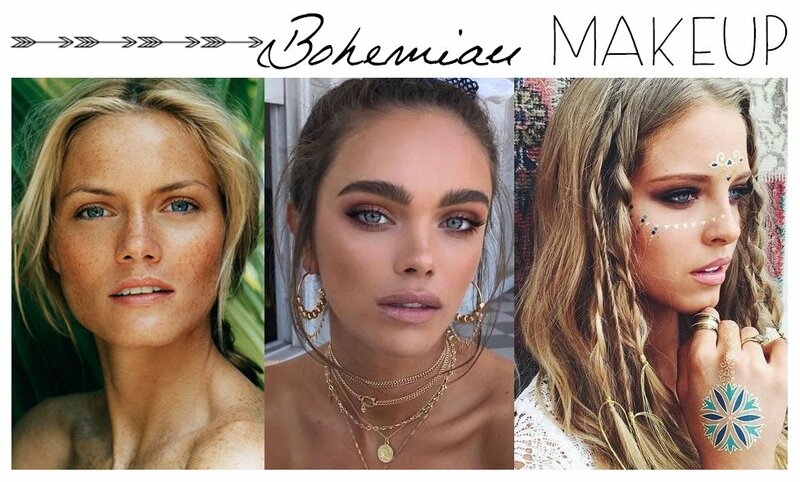 Most bohemian-inspired makeup focuses on the skin and eyes rather than the lips, with natural soft smoky styles being some of the most popular choices. Go for natural color palettes that range from soft, earthy browns to maroons and peach, plus muted violets and desaturated reds. Embrace matte finishes rather than glittery or extra shimmery eye-shadows. Create layers and depth rather than structured lines when applying eyeliner and eye-shadow. Count on a wearable smoky eye look in earthy tones as your staple go-to. Stay away from harsh colors like bright blue, hot pink and yellow, saturated greens and orange. Avoid ultra-defined eyes with perfectly applied eyeliner and go for a smudgier, more natural effect instead. Soft, healthy-looking, hydrated lips in warm hues are always a perfect choice when trying to look boho from head to toe – while harsh colors, high-polish lipstick or too-defined lips are a no-go. Go for natural lipsticks in shades of peach, blush, maroon or soft light browns. Seek warm undertones rather than cold hued shades. Opt for matte or hydrating finishes and avoid ultra-glossy lipsticks in rich hues. Go lipstick-free and opt for hydrating lip balm instead. Stay away from stringent hues like magenta and hot red. Avoid unconventional lipstick colors like blue, black and purple. Forgo ultra-finished looks with highly defined lips and opt for more natural effects instead. Bohemian style is universal – and that means that men can enjoy the effortless, chic-cool look just as much as their female counterparts. With bohemian icons like Johnny Depp and Lenny Kravitz as inspiration, fashion lovers can easily create their own effortlessly-cool outfits where pretty much everything goes with everything with little hassle. From floral shirts to skinny denim and from printed pants to retro chic outerwear and an overload of accessories, men have a wide range of bohemian styling options. Mix volume with form-fitted attire or go all in on loose, relaxed tops and bottoms. Add patterns into the mix (more than one goes as well) for that artsy boho look. Include vintage or vintage-inspired accessories, elements and prints. Load up on accessories, including braided leather bracelets, antiqued finish rings, oversize scarves, stackable cuffs, sunnies and fedoras. Good news for the lazy fashion lovers: grooming to perfection is definitely not a must – if anything, quite the opposite. Do your shopping in thrift stores and vintage shops for a look that’s not only boho, but authentic to the hippie eras. Say yes to man buns, messy buns, beards and everything in between. When it comes to embracing the bohemian look, one of the main things you should focus on is investing in a few unique, nonconformist shirts. Basically, that means that you can safely ditch the solids and the discreet masculine patterns for bold florals, swirly and paisley-loaded garments in statement shades. Similarly, go for rich browns and maroons, oranges and mustards (in true 1970s fashion), and switch the classic pinstripes for wilder, artsier alternatives. If you aspire to look like the likes of Lenny Kravitz, ironing your tops and shirts to perfection is certainly not a must, as looking slightly undone as opposed to crisp-clean and neat is a main rule of the boho aesthetic. Moreover, despite the fact that you’re wearing button-downs, buttoning your shirt all the way up is counterproductive when aiming for that subtly disheveled look. In addition, you should wear your shirt in unconventional ways: with the sleeves rolled up, half-tucked in, layered over tees or in extra-loose fits. Take your unconventional approach to fashion when shopping for pants and shorts as well. Rule number one: shorts are not destined exclusively for your vacations, weekends and for the beach. In fact, they can be a staple of your bohemian wardrobe just as much as pants. Likewise, in order to take the boho look even further, make sure to incorporate a few patterned shorts into your wardrobe, featuring unique and creative statement prints. For a smart-casual approach to bohemian style, opt for a pair of chino shorts in a longer cut and pair them up with a relaxed button down for a look that’s as boho as they come. As for pants, a few good pairs of denims are essential – and appropriate for most occasions. Whether you go for a light wash or acid wash, a distressed pair of jeans or a dark wash, make sure to opt for a slim or skinny cut. Printed pants are another option when embracing the boho look – and yes, you can totally rock a printed top with a pair of printed shorts or pants. Extra tip: just make sure they follow sister color schemes. Layering is one of the biggest ‘rules’ when it comes to mastering the boho look to perfection – and nothing does that better than cool outerwear, layered on top of your printed shirts and vintage tees. Option number one: retro blazers in groovy oversized patterns, following color palettes depicting the funky 70s. Option 2: upgrading your bohemian street style with a smart-casual, loose-fit blazer. Option 3: welcome worn-out suede jackets into your wardrobe, as well as distressed denim jackets, loose-fit anything especially if it carries a vintage vibe, as well as knits of all kinds, including vests, the Lenny Kravitz way. A good outfit is never complete without the right pair of shoes. Well, the authentic bohemians of the 60s might actually disagree, as their favorite look was, you guessed, a barefoot one. While that might seem like a stretch in today’s urban climate, opting for the next best thing, aka sandals, is definitely welcomed when aiming for that effortless boho look. Go for leather straps galore sandals (for the equivalent of women’s gladiator sandals) or upgrade your look with a pair of loafers in suede. Alternatively, save the unlaced boots (preferably in suede and preferably adorned with studs, cool laces or even patterned) for the cooler weather. 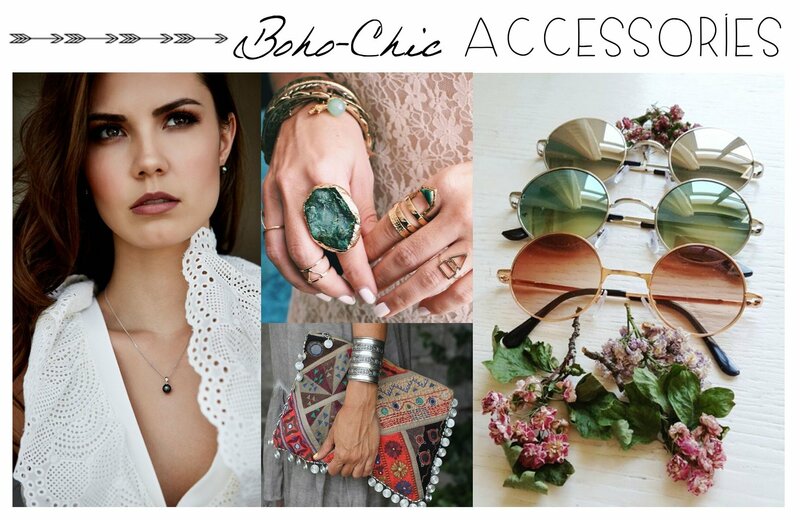 No truly boho outfit is ever complete without the addition of accessories. In fact, some might argue that accessorizing well means half the job is done. 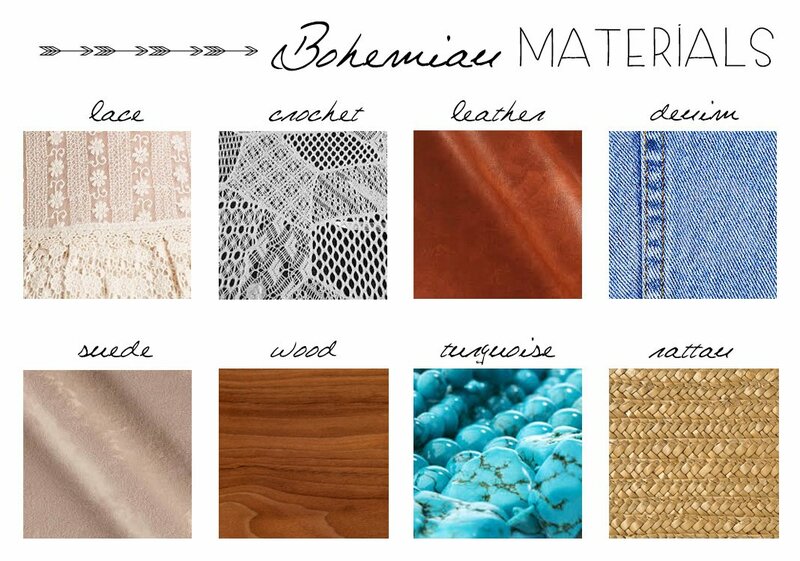 For a truly bohemian look, anything that comes in a finish that’s too lustrous or too polished is a no-go. Basically, you should embrace everything and anything that looks or, even better, is antiqued, vintage or worn-out. Strive to achieve that artisanal feel bohemian trendsetters effortlessly pull off by ditching your expensive watch for leather bracelets, oversized scarves, wooden beads, canvas totes, studded leather belts, fedora or straw hats and the mandatory vintage sunnies. Alternatively, incorporate gems into your jewelry game by adding a pop of natural turquoise or single pearl necklaces on leather at choker lengths. There’s no question that leather pearl necklaces are the epitome of Bohemian-inspired men’s jewelry. The combination of the gemstone and the leather has a vintage look and feel that can add a dash of cool to a multitude of outfits. Necklaces not your thing? Leather pearl bracelets are also available. What started as a subculture representing an eccentric, unconventional part of the population a couple hundred years ago became a mainstream culture in its own right. 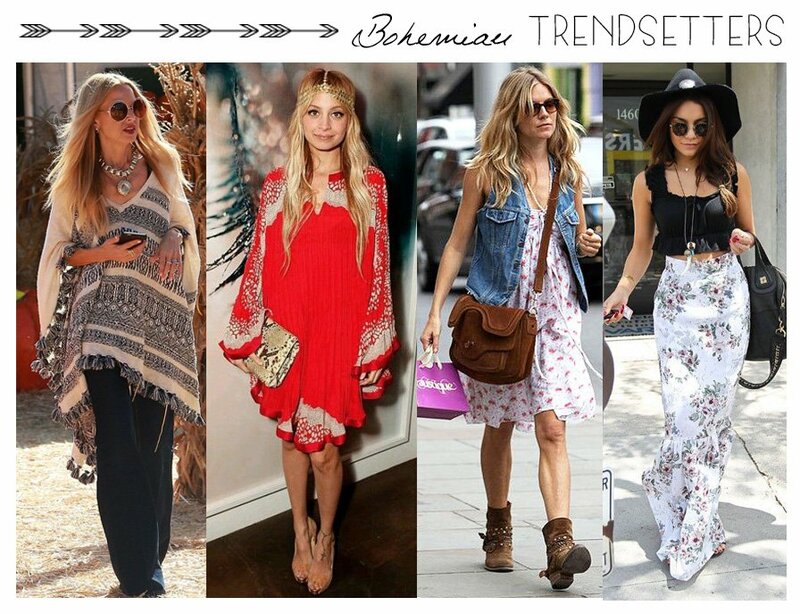 Bohemian style is definitely more than just a fading trend – and it’s more than just a fashion craze. It’s a veritable lifestyle, complete with a highly recognizable and equally artistic corresponding way of dressing. As a style where the most eclectic mixture of prints and materials meet, bohemian style is not only the representation of a wide range of cultures around the globe, but also the fusion of different iconic fashion eras. Carla Jonas is a content writer and editor at Pearls of Wisdom by top high-quality pearl retailer The Pearl Source. Passionate about everything jewelry and fashion-related, Carla is ready to bring you the latest updates on hot trends, style tips and more. Should You Try Mixed South Sea Pearls?